Effectively designed & installed pathway lighting can add nighttime curb appeal, walkway safety & even security to dark areas of your property. With any pathway lighting project it’s important that your layout compliments your buildings architecture, your surrounding landscape & incorporates other outdoor lighting features. Your goal with any outdoor lighting but particularly pathway lighting is that it should match and blend with your property. 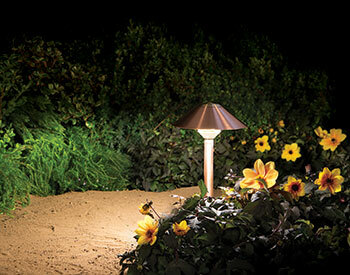 Finding the right balance of light for pathway lighting can sometimes be difficult. Consider what’s most important to you—safety or curb appeal. Pathways that are too dim are useless and can even be dangerous. However, pathway lighting that is too bright will cause the curb appeal of your property to suffer. Looking at the material a fixture is made of will probably determine which pathway lighting fixture is best for you. Bronze is a popular trend that fits both traditional and contemporary style homes. Bronze material will withstand different weather conditions, while still maintaining the pristine look as when you first bought it. Black and titanium are rising in popularity and look good with both traditional and modern homes. While brass finishes can go very nicely in a yard, try to stay away from this finish, unless you are willing to polish it frequently. The path you or your guest will take to your entrance doors are the most important areas to be illuminated. Evenly spaced lights will provide a balance of light for those using the pathway. 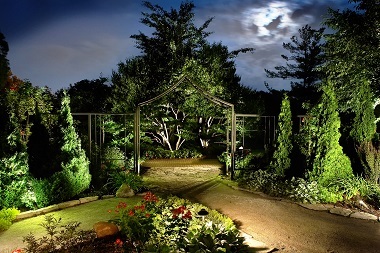 A well-lit pathway will help you and your guests see obstructions and avoid any slippery areas. Adding pathway lighting from your dock to you home and the walkway around your pool area will add safety and create beautiful reflections off the water. A common question people often ask is, “How far apart should pathway lighting fixtures be?” This is a great question, and is dependent on a few things. For residential purposes, 5 to 8 feet apart is generally a good rule for placing the average lights. However, if your pathway lighting fixture is brighter than average, use your own judgment and test a few different distances out. It’s okay to experiment! Alternating the side of the path for the fixtures is a popular technique. It will prevent you from the tendency to over-illuminate the path, and it gives a more attractive and balanced effect. For commercial areas, 4 to 6 feet apart for the pathway lighting is a good guideline to follow. 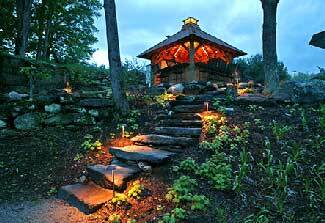 When it comes to outdoor lighting and pathway lighting, a little goes a long way. At Coastal Outdoor Lighting every lighting design starts with a “Free Onsite Consultation” by one of our trained & certified illumination specialists. For the very best pathway lighting design & installation please complete our online request form or for the fastest response call us today @ (239) 491-6759.